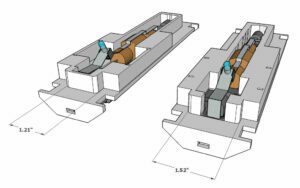 There are what I titled above ‘restrictions’ on the design of the long and short hoods. Take a look at the long hood .. much of this will apply to the short hood. Overall we have the maximum and minimum width, length and height. These numbers are NOT pulled randomly out of where the “sun don’t shine” – but are created from the restrictions placed on us by things like the mechanism we are using to power the locomotive, the width of similar locomotives in ‘real life’ and the human required to operate the vehicle. 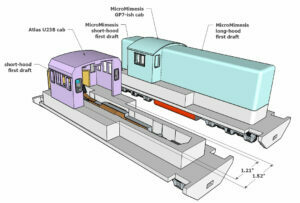 What we have here are the ‘maximum’ dimensions as long as we stick to NMRA Old Time Dimensions. 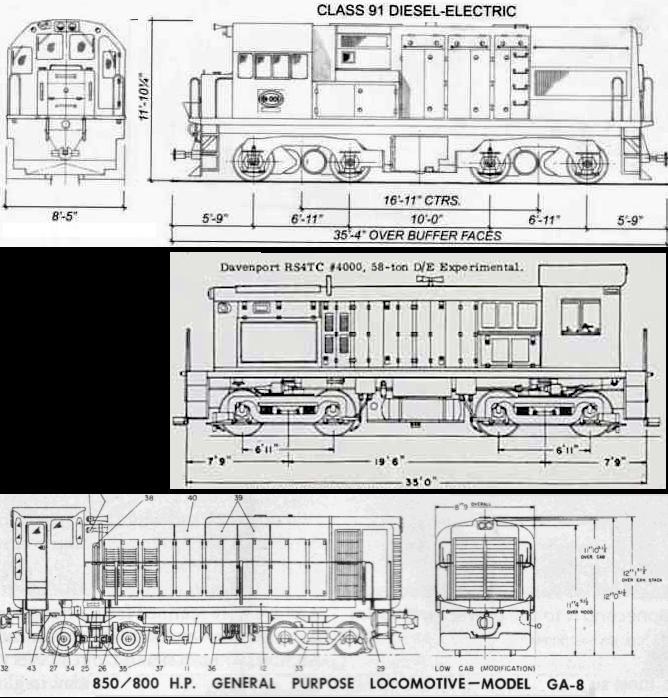 Width = 3″ / 76.2mm .. note: Narrow Gauge locomotives with extra wide cylinders, such as ‘K’ types, require Class dimensions so the width increases from 3″ to 3-3/4″ or 96mm. 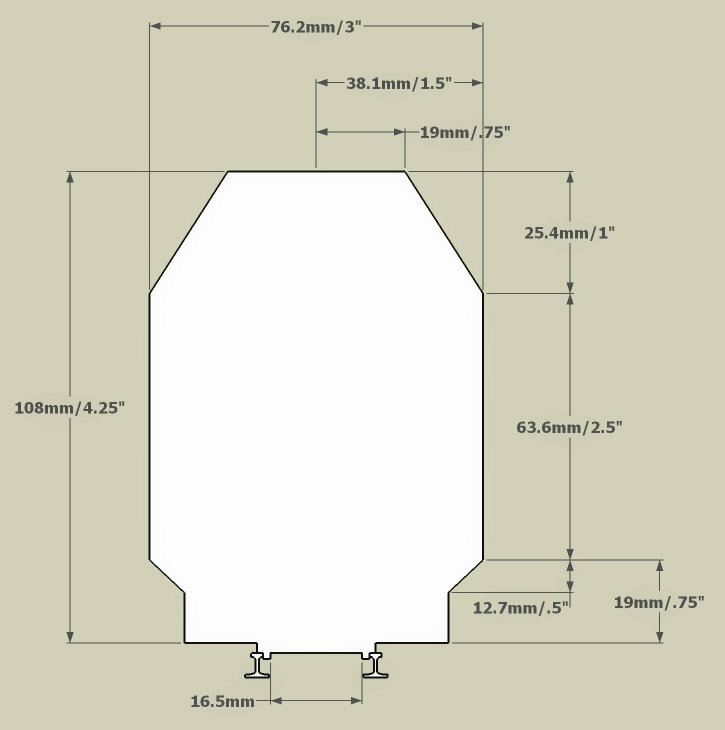 Height = 4.25″ / 108mm – maximum indeed. The locomotive is quite a bit shorter than this. Other dimensions I will ignore. 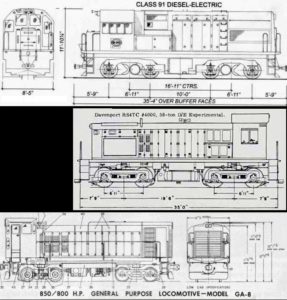 Here are three narrow gauge diesel locomotives, the CLASS 91, Davenport RS4TC and GA-8. Andrew wanted to use an O scale Atlas U23B cab. It measures 2.460″ in width. Full size that scales to 118″ or 9′-10″. While a bit wider than the reference switchers it is only about 6″ per side larger. I went with this- heck .. I did this for him after all. 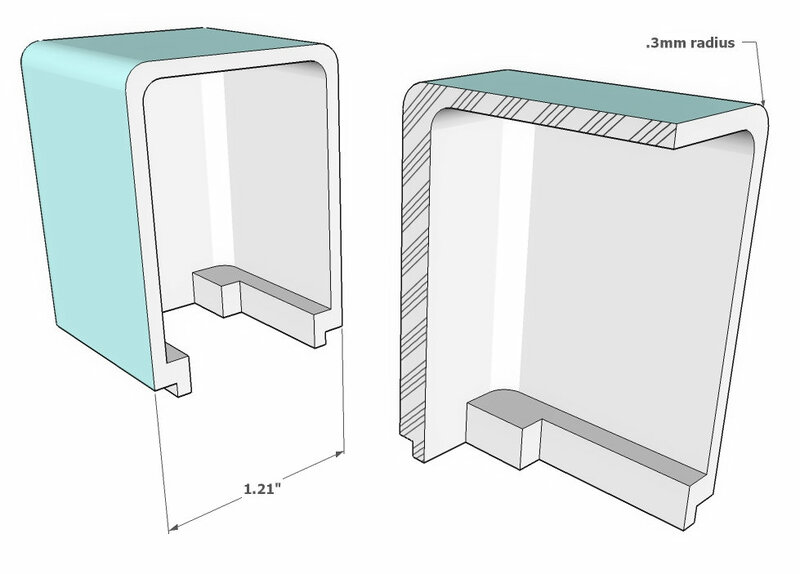 Finally – the width of the hood then is the overall width of 2.46″ of the cab – minus the 30″ walkway width – .625″ x 2 = 1.25″ total walkway width. 2.46″ – 1.25″ = 1.21″ width. The bottom is made to lock into the frame. Other than that .. and the 1.21″ width, the sky is the limit. I made this short hood the height I wanted .. just under the roof of the GP7-ish cab I designed. The length was just made so .. ‘because’. I made .3mm radius on the corners because I wanted an older look. Newer hoods would have a much smaller radius of course. 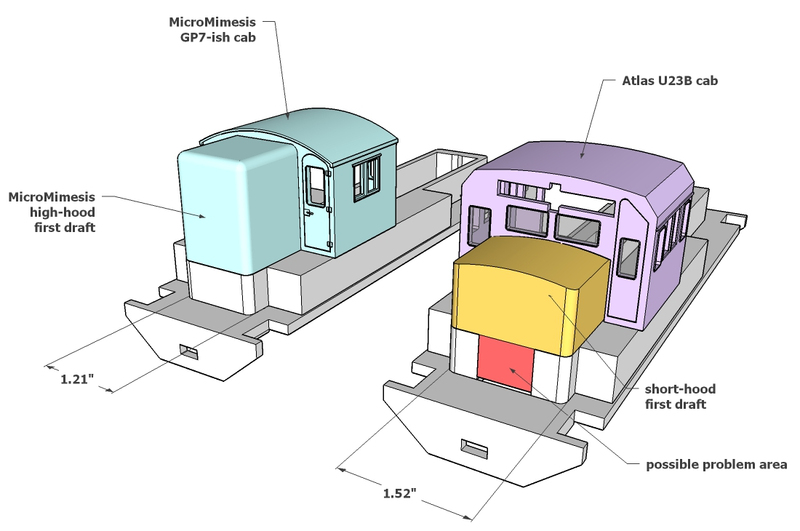 On the left we have my MicroMimesis GP7-ish high-hood cab with the first draft of a high-hood to go with it. Note that the hood is 1.21″ wide per earlier discussion. The front deck is .625″ (30″ full-scale) wide. 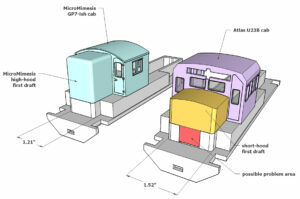 On the right we have the Atlas U23B cab. The opening in the front of the cab is 1.52″ wide. The short hood shown was made to fit that width. The frame/chassis is an earlier version lacking the piece across the front as I did with the frame on the left. On the left you can see I added a piece across the front to strengthen the frame/chassis and act as the lower half of the high-hood. On the right is the earlier version frame/chassis without the added piece. Notice that the mechanism runs right up against the end. Adding the piece would lengthen the short-hood by that amount. 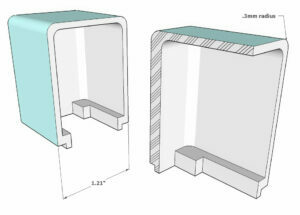 A quick look at the two designs from the rear. I just extended the draft short-hood to create the long hood for the far engine. Closer you can see the large opening in the back of the cab. 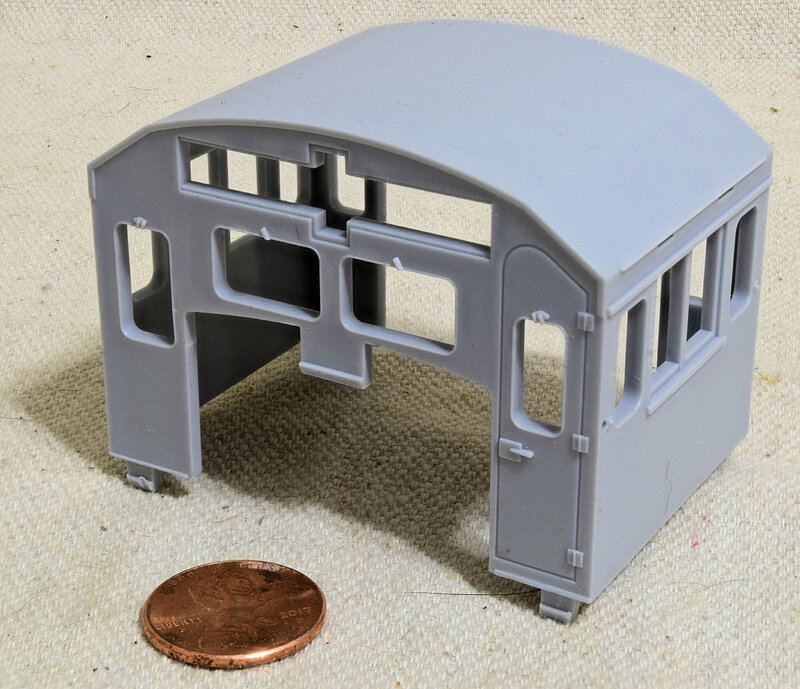 This 1.52″ width of course was for the original standard gauge hood. To use this cab the opening would have to be closed up or the long hood would have to taper back to the 1.21″ width. I dropped one of the earlier frames and the corner of the .. front .. pilot? I am using just a standard PLA to prototype and it is somewhat brittle (arguably .. if I had dropped a regular HO body to the floor the styrene would have been damaged also)> I see where I can purchase PLA+ (plus) which is at least twice as strong. Has anyone used one of the *plus* ..aka .. stronger PLA filaments?